1 How to delete Snapchat ? 2.2 How to know if my snapchat account was hacked ? How to delete a Snapchat account ? 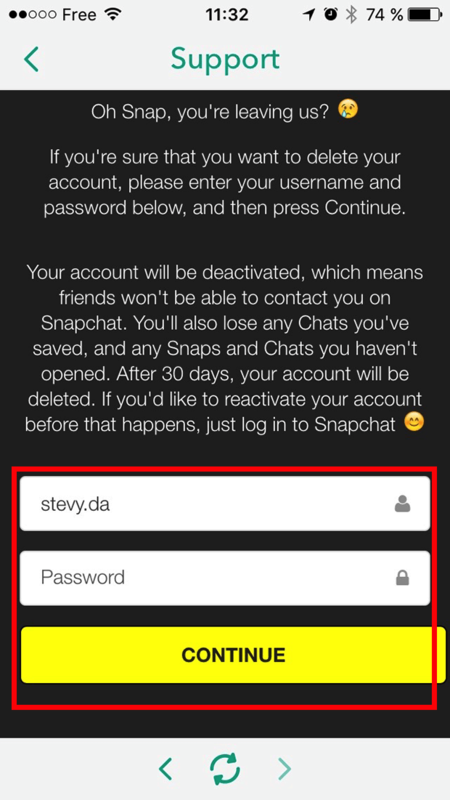 How to remove a Snapchat account? 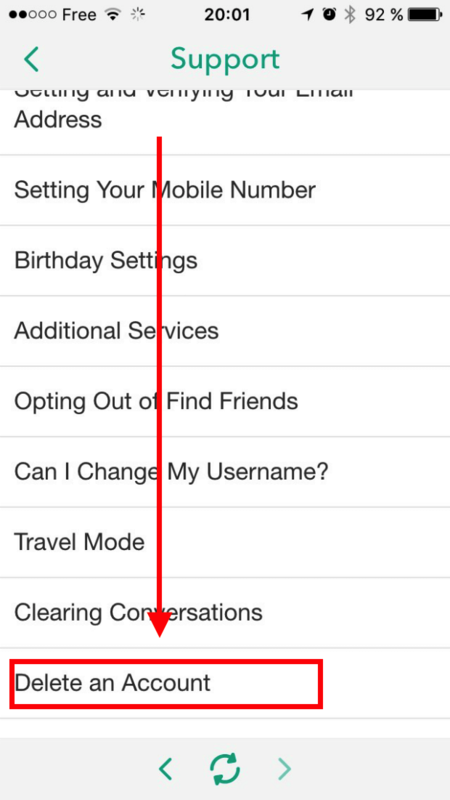 How to permanently close a Snapchat profile? 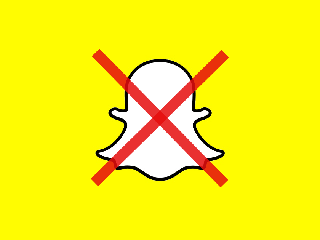 How to uninstall Snapchat and delete a Snapchat profile ? Delete-Account.net propose you a tutorial to understand how to delete a Snapchat account. Snapchat is one of the most famous mobile app. At the beginning, Snapchat was used to send messages and to share photos and videos between users with the particularity that every content sent is deleted some second later. From this point Snapchat has developed its functions and services. Totally free, Snapchat is particularly used by teenagers even if more and older people are beginning to use the app (even brands are starting to use Snapchat to promote product and services). But Snapchat has also a bad reputation. The app is famous to be frequently hacked. In the past, many security problems were report. Personal datas and even pictures of users were stolen. How to delete Snapchat ? 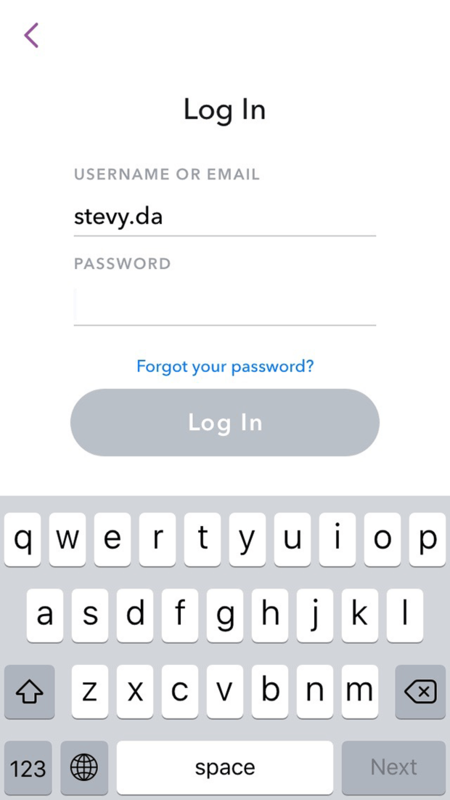 To beginning, log in to your Snapchat account. Log in with your username and your password. When you will be connected, tap on the top of the screen on the Snapchat icon then tap on the setting icon to arrive on the settings menu. Tap on the top of the screen on the Snapchat icon. After that, tap on the right top on the settings icon. You will arrive in your settings. If it’s your phone, you shouldn’t have trouble to connect to snapchat. If you have forgotten your ids, you can get back your id by tapping on the link “forgot your password”. If you forgot your password you can get it back by tapping on “Forgot your password”. 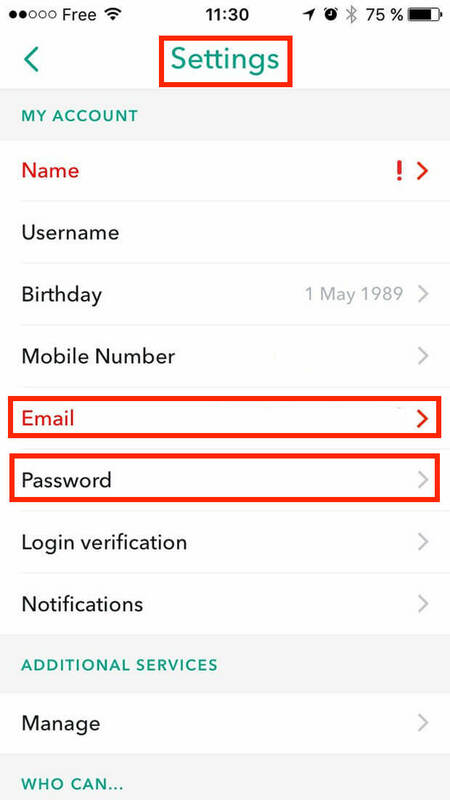 By the way if you want to change your snapchat username, your connexion email or you password you can do it directly from the Snapchat settings menu. 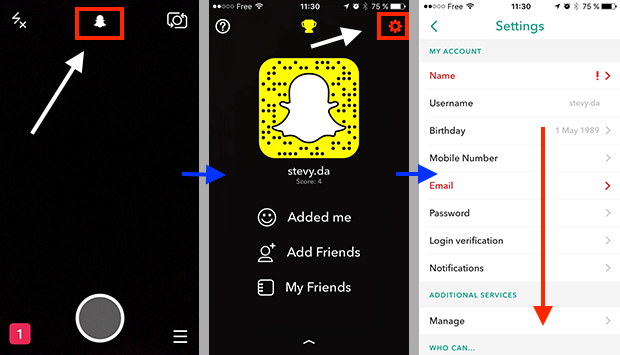 On your Snapchat settings, you can change your email, your user name or your password. 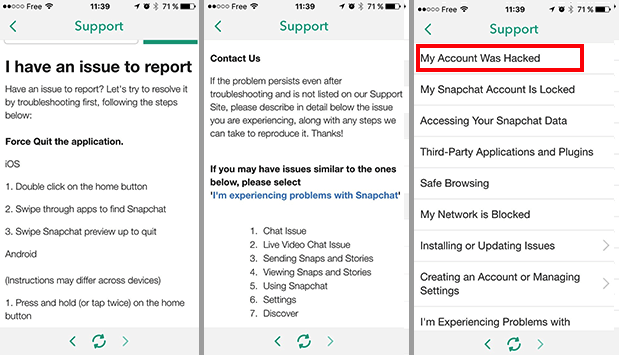 If you have problems to log, you can see with the Snapchat support to get more help (see after in this post). To delete a snapchat profile, go in your Snapchat settings. Tap on “support”. When you are on the support page, tap on “Learning the basics”. Go on the bottom of the screen, you will find a title : “Account Settings”, tap on it. Go to Support. Select “Learning the Basics”. You will find “Account Setting” on the bottom of the screen. Tap on it. Finally, you will find on the bottom of the screen the link “Delete an Account”. Tap on it. To delete a Snapchat account, tap on “delete an account”. To delete a Snapchat account, you will just have to enter your username and your password. Enter your username and your password then tap on continue to delete a snapchat account. If you delete a Snapchat Account, you will delete all of your datas and your profile. Without an Snapchat Account, you will not be able to use Snapchat anymore. 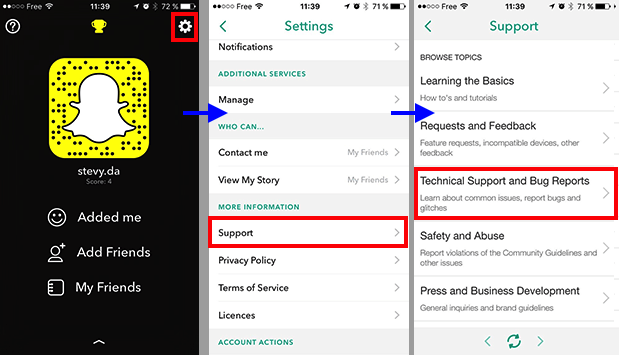 If you got trouble with your Snapchat profile, you can get help by the Snapchat support. To begin, go to your settings menu. Select “Support” then select “Technical Support and Bug Reports”. You can contact the Snapchat customer service by the app. Go to your settings, Go on support then tap on “Technical Support and Bug Reports”. You will arrive on the page “I have an issue to report”. On this page you will find different links to solve your problem. For example on the page you can find “My Account Was Hacked”. You will find different indication to help you to solve your problem. 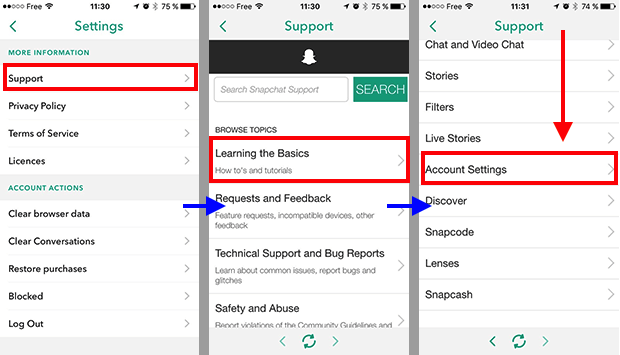 You can also access to the Snapchat support and ask for help by the web and this link : contact Snapchat. 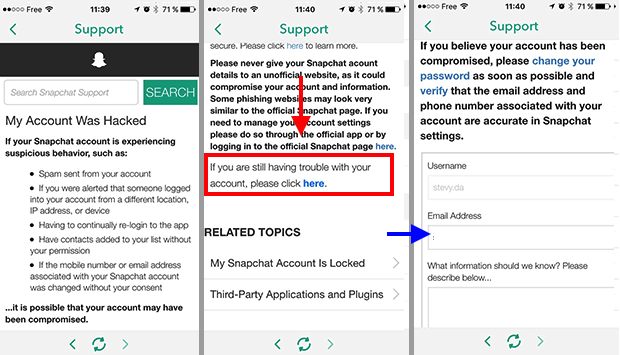 If your Snapchat was hacked, you can get help from the support section of the app. Tap on “My Account Was Hacked”. You will find different answers and tips to solve your problem. How to know if my snapchat account was hacked ? Snapchat has suffered numerous hacking since its launch. These attacks target members’ pictures and personal datas of account users. E-mail, phone number and even pictures. In all, more than 100,000 Snapchat photos were stolen and more than 4 million Snapchat accounts were hacked. How to know if your Snapchat account was hacked? To see if your Snapchat account was hacked, a verification tool is available for Snapchat members. To verify that your Snapchat account is not affected click the following link : check if my Snapchat account was not hacked. The tool tells you whether your Snapchat account was hacked. If so, it tells you what information has leaked on the internet and you should better decide to delete a Snapchat account even if you can do nothing anymore.